Until five minutes before my interview to be editor in chief, I was more than a little apprehensive at the administrative decision to move the paper to an online-only format. I am from the small minority that still gets its bulk of news from print papers and print magazines. Until that five-minute point, I was only applying to keep The Purple and White alive (did I mention that my application was the only one submitted?). One of the major reasons I enjoyed my time working with Victoria Sherwood’s amazing staff was, at the end of the day, my submissions, those pages I edited, would become incarnate bearing the letterhead of The Purple and White. Looking back on it, I realize how immature my apprehension about the paper going online was. What great person, group, invention or idea wasn’t timely? What do we remember that did not actively engage the culture of its era? Angst over the newspaper losing its print format comes out of nothing but nostalgia, but I am proud to say, no amount of nostalgia will be stopping the publication next semester. Starting next semester, we will have a very new publication on campus. I say this is very new not just because of the change of format, but because of the nature of the two formats and how truly different they are from one another. In a print-newspaper, updates and relevancy of articles are only as current as its print cycle is regular. 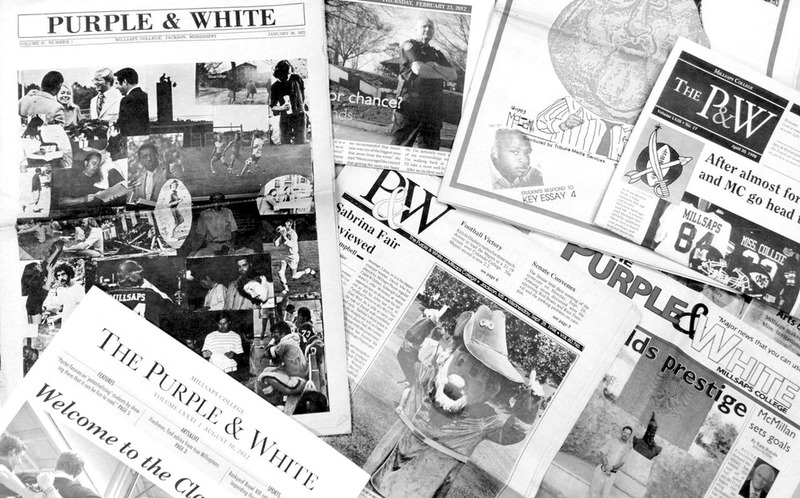 With the current paper’s format, if some large and important event happens right after the paper is printed, it will take two weeks for The Purple and White to report to the students. In a print newspaper, content is limited to the column-inches available within the pages of the paper. Although the URL’s linking an article to other sources can be printed, it is difficult to transcribe accurately. When it comes to busy students, I believe the expression is: “Ain’t nobody got time for that.” Reading a print newspaper offers the additional hurdle of finding a copy across campus, which may not seem like a problem to most, but copy availability can be very difficult for those who want to get their student news quickly. An online publication almost seems like a silver bullet for these problems. Events on campus can be reported on as instantaneously as the staff is willing. This means no waiting for coverage on large Millsaps events or break-ins on campus. In the wonderful world of the Internet, the problem of column-inches limiting what can be said about an issue is completely eliminated. Articles can be as long as a 1,500 word tirade or as short as a under 140-character Twitter post. Because of a website’s ability to embed and post URL links, an online newspaper can post pictures, videos, additional articles from other sources, etc.—all the while lending a more three-dimensional rendering of the event we are trying to capture. Students will also have the ability to comment on and discuss the topics of each article.With the help of simple domain names and mobile apps (that’s right, a P&W mobile app is in the works), next year’s paper will be easily accessible whether you are on campus or a continent away. The benefits of the online website will lend a lot to the quality of the product our students will be consuming. We as students at Millsaps College do not have a website devoted to students and their needs. My goal is that by offering features like the “Friday+Saturday” tab (a tab devoted to helping you plan what you will do this weekend) or the “Game Plan” (a sidebar on the Sports tab that will post weekly the times of both Major athletics as well as intermural games), our website will learn from the student body their readership. We plan to maintain the high degree of journalistic integrity that Sherwood has left us with during this transition. Our goal is for the paper to become a key way of understanding all the goings-on on campus. I am very enthusiastic for the coming year, and I hope each and every one of you are ready for the launch this winter break. Thanks for your commitment to The Purple and White. I will see you all this Spring!